Building on the excitement of World Book Day, our Middlesbrough Reads campaign has created a set of reading logs to inspire children of all ages to read for pleasure and more widely. Our research shows that children who are reading at their expected level or above are three times more likely to have higher mental wellbeing than their peers with lower than expected reading skills (40.3% vs 13.1%). The reading logs have been developed in partnership with the Middlesbrough Promise and will be distributed to primary schools across the town and can be downloaded from the link below. 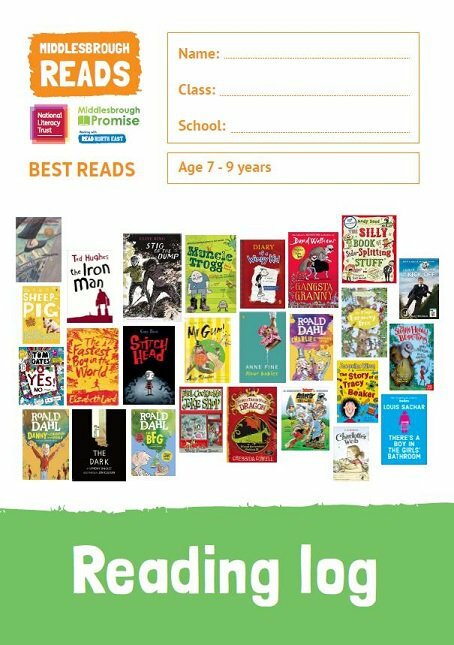 Once a child has read at least six of the 26 titles in their age category, they are invited to complete a book review about their favourite. All submissions will be entered into a prize draw at the end of school year, in which one lucky child will win an iPad mini. "Thank you for the reading logs – they are fantastic – really high quality too!" "Thanks – they’re great! And they’ve given staff some more ideas for whole class books as well!" "I’ve got to say the reading logs are fab!"